Props: Andre Rademeyer, Casper Viviers, Des Sethie, Jason Benade, AJ de Klerk. Hookers: Obert Nortje, Niel van Vuuren. Locks: Tjiuee Uanivi, Ruan Ludick, Adriaan Ludick. Loose forwards: Thomasau Forbes, Max Katjijeko, Renaldo Bothma x, Prince Goaseb, Rohan Kitshoff (vice captain). Scrum halves: Damian Stevens, Wihan von Wielligh. Fly halves: PW Steenkamp, Cliven Loubser. Centres: Darryl de la Harpe (captain), JC Greyling, Henrique Olivier. Back three: Johan Tromp, Chrysander Botha, Chad Plato, Janry du Toit, Justin Newman, TC Kisting. Do you know a free stream about this match? Canalina wrote: Do you know a free stream about this match? How about the russian squad? Is it full strength? And if it is who do you think will win it? Is it L'Equipe Tv (French Baabaas v Tonga) free? 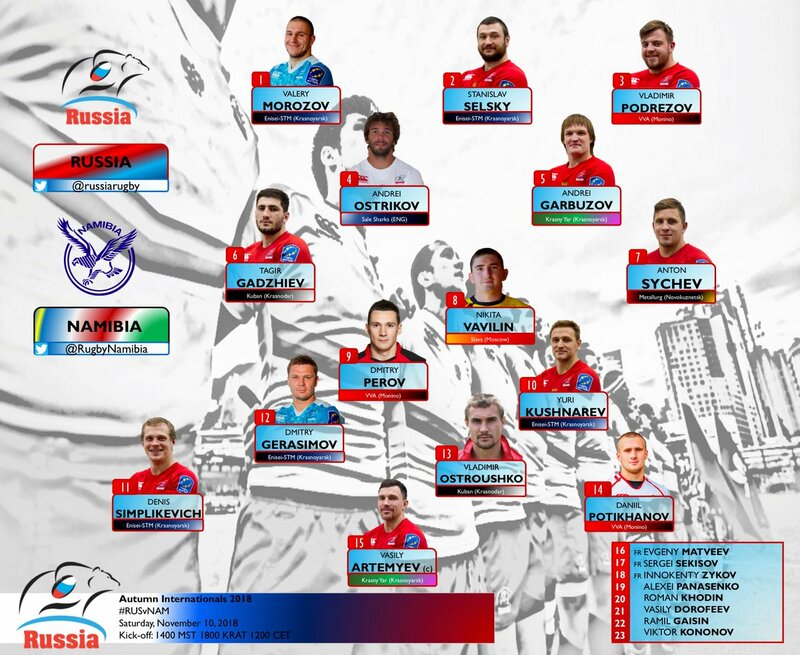 RugbySwizzie wrote: How about the russian squad? Is it full strength? And if it is who do you think will win it? It’s about 2/3 of a first choice squad. Ostrouhsko is back for the first time in a while, keep an eye on him at 13. Seriously dynamic and damaging runner. Yes it is free. Channel number 21. Their website will show the game too, but will probably be geoblocked. They use some young players alongside some very experienced ones - I am really looking forward to seeing how the game will unfold! Any word on ticket sales? As of yesterday12000 tickets have been sold, children are free. Good to know! Hopefully this will show touring teams Russia is an option in November. thatrugbyguy wrote: Good to know! Hopefully this will show touring teams Russia is an option in November. It is now warm autumn, October was warmest in 140 years. But it happens in different ways. In Krasnodar today + 8 +11 C.
Might be on the other side of the camera. People still coming in. thatrugbyguy wrote: Might be on the other side of the camera. People still coming in. In the chat they wrote that weather is bad! + 10! Big amount of military in. Big sponsors names on the hoardings. The hand of Artemyev is clear. There's a lot more people on the other side of the stadium. Not sure why they wouldn't fill up the TV side of the stadium first. Any reason why there isn't TMO? Straight question, no second intentions.